Gonzalo De Lucas has an article about Serge Daney in the latest issue of Sight and Sound. I love the way he uses Daney's ideas to develop his own thinking. In a beautiful review of Paris, Texas (Wim Wenders, 1984), Daney evokes a scene from In a Lonely Place (Nicholas Ray, 1950) where Humphrey Bogart and Gloria Grahame are standing in the kitchen and he says: "A good love scene should be about something else besides love. For instance, this one. Me fixing grapefruit. You sitting over there, dopey, half-asleep. Anyone looking at us could tell we're in love." Daney writes: "And soon the viewer tells herself that maybe they are, but she wasn't actually thinking about that. Emotion aroused by the precariousness of the instant and the fragile beauty of cinema is able to make us feel that a scene is 'close' to us without needing to bring the camera 'closer'. Without the intrusion of the close-up, of the indiscretion of a zoom. That which we can call 'emotion' is a reverse camera movement which takes place in the body of the viewer." Here we have another truly cinematographic idea (and if Daney did anything in his writing, it was to put ideas in circulation): only this time it hasn't been created by the camera but by the encounter between the word and the image. It prompted me to read again Daney's review of Paris, Texas. It's a great text. Here's a translation. A beast, one would have to be a beast not to be moved by the last scene of Paris, Texas. The boy who played on his own in the left-hand corner of the frame (he’s wearing a small black kimono, he’s eight) slowly stands up towards the woman who has timidly entered the frame, from the right. And because his movement is slow, it’s as if he was growing up in front of us. No too much. He’s only a child moving towards the woman that he hasn’t seen for four years, half of his life, his mum. He tells her: “your hair is wet”, she takes him in her arms, and he holds onto her like a little monkey. Outside, a man who “came back from the brink”, the father, is leaving for good. It all happens in Houston, Texas, and it’s the end of a melodrama. Not quite though. In a melodrama, there would have been music and close-ups, the man would have stayed, the re-united family would have cried. So Wim Wenders has pulled off an “almost-melodrama”. This is why the film received an ovation at Cannes where it saved this year’s prizes from shame. Emotion was peaking at the time, and like time, it has passed. Wim Wenders occupies a unique place in cinema. The ungrateful and exposed place of being “top of the class” (there’s another one, more blunt and prank, but he’s in the USA: Spielberg). For more than ten years, we have done more than see Wenders’ films, we have observed his progress. Wenders prefers to observe landscapes, neon-lights, clouds, highways. At times, in between two planes, we catch up with him. And we lean over our favourite patient, cinema. How is it doing? What’s left of it? How will Wenders season the leftovers, the landscapes and the children? Quite well actually. The odd and nomadic couples? Fantastic. The spleen of cinephilia? Receiving it loud and clear. Narration? Still laborious. Love scenes? A tad puritanical. Women? They’re difficult to film. Emotion? Contained, but less so. Etc. This may be a first: such connivance between a filmmaker and his audience: Wenders has the privilege to touch people in their forties and to seduce those in their twenties. It’s as if the best pupil of the class was revising an impressive curriculum of history and geography (of cinema) which we would have gone through. As if we were asking him to surprise us at every movie, but not too much, otherwise we couldn’t be the witnesses of his progress. The progress of a “passeur” navigating by sight towards a possible suite of cinema. Hence the emotion. To continue, one must know from what or whom he’s continuing. And, among others, John Ford, Allan Dawn, Yasujiro Ozu and Nicholas Ray have counted for Wenders. He is carrying on from these contemplative filmmakers, with this emotion that no one seems to be able to create anymore from a succession of images and which I’ll call, for lack of a better term, “the emotion of the long shot”. What does this mean? I’ll take an example from Nicholas Ray’s In a Lonely Place, even if I may not remember well this old movie (but isn’t cinema also made of what we have hallucinated?). 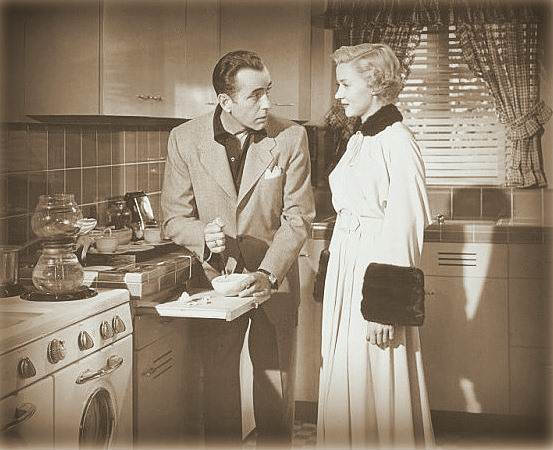 The Humphrey Bogart-Gloria Grahame couple are fixing grapefruits in the kitchen (was it grapefruits?). Nothing happens and then Bogart says something along the lines of: if people saw us now, will they guess that we’re happy? And the viewer, straight away, thinks yes, perhaps, but a second earlier, it wouldn’t have crossed our minds. Emotions aroused by the precariousness of the instant, and the fragile beauty of cinema is able to make us feel that a scene is “close” to us without needing to bring the camera “closer”. Without the intrusion of the close-up, or the indiscretion of a zoom. That which we can call “emotion” is the reverse movement which takes place in the body of the viewer. It comes from what we’re suddenly guessing. But which is the most important word: “guessing” or “suddenly”? Both. “Guessing” because we have almost missed that moment. So we accept to stay at the kitchen door of In a Lonely Place, and it’s with a different eye that we notice Ray’s great scenography. I took Ray as an example, but I could have mentioned a hundreds others, from Paris, Texas. Wenders has received a lot of praise for the way he can convey a style – almost a “Wenders’ touch” – to the way he films landscapes and makes them photogenic. But if his talent stopped there, he wouldn’t have made Paris, Texas, and especially not the last scene. The watcher needs to stay distant, but he runs two risks by keeping its distances: coldness and mannerism. Wenders hasn’t always avoided them. But what saves him from his own ease, is his certitude (strongest than ever in his last film) that there must be one distance (and only one) from which each thing (men and landscapes) appears not only as strangely “distanced” but as the affectionate promise of a secret. A secret we couldn’t tell (Ozu), it would be elegant to keep quiet (Dwan) or painful to revive (Ford). Up to the filmmaker (using his immense talent for scenography) to keep the viewer in a “long shot”: at the kitchen door, in the Mojave desert, in a bar or a shabby motel, in a peep-show, anywhere the story happens. To learn to live with the secret, like Travis’ (heroic) brother in Paris, Texas. To give the characters the time to befriend each others, like Travis and his son, the little Hunter, on the way back from school. The right distance for Wenders is the one from which we could want at the same time to force the secret out and to leave it untouched. This “at the same time” is the time of the emotion. Contemplative filmmakers aim to be worthy of a landscape but not to own it, to furtively slide into it without being noticed, to modify it but not re-create it. What does Travis, the man who (quoting Wenders) “is coming back from the dead”, want? The same thing as Wenders when he “comes back” from the myth of the death of cinema. The same thing as us when we give an ovation to Paris, Texas in Cannes. To fit back into the (family) picture from which he had disappeared, to take the time needed to modify a detail. Only one detail but a sizeable one: to move the child from a corner of the picture and place it “next to” a woman whose faded features haunted another place of the same picture. It’s an alteration, the work of an acupuncturist. Then, Travis leaves the picture a second time, with his secret intact. The (often ordinary) secret is not a piece that can be spit out, it’s the horizon of an asymptotic curve: the closer one gets to it, the further it gets. By getting closer to Travis, the man who emerged from the desert, we didn’t see that he was getting away once more. The Wenders-emotion is a boomerang. First published in Libération on 20 September 1984. Reprinted in Ciné-Journal, Cahiers du cinéma, 1986, pp. 253-5. Translation by Laurent Kretzschmar. 2012 marked twenty years since the passing of Serge Daney (who died of AIDS in 1992). The "anniversary" triggered many events in France, including an programme of conferences, lectures and movies at the cinémathèque française, a new documentary and the publication of the third volume of Daney complete writings. I wish English-language publishers had seized the opportunity to get a book of translations out, but that wasn't to be. Yet, there's hope. Several translations of Daney popped up here and there, in DVD booklets, books, blogs, etc. Daney seems very much recognised and discussed. I take it as a sign that we have all stopped waiting for "official" translations and that it's now down to us to carry on the task of translating where and when we can, what we judge relevant, interesting, or simply worth sharing. So I shall be carrying on in 2013 the task of referencing English translations of Serge Daney. I might do a few myself. As always, if there are volunteers willing to help out, do get in touch. Otto Preminger, The rules of the game. Two texts on Jerry Lewis: Frank Tashlin's Who's Minding The Store? : Frank and Jerry and Smörgasborg. The subtitled version of a documentary / conversation between Daney and Jacques Rivette. Nick Ray And The House Of Images. Two early articles on Douglas Sirk and Mark Donskoy. A whole raft of translations on the diagonal thoughts blog. The text Daney wrote when he discovered (literally) Arthur Pelechian. An analysis on "the relativity of film criticism" in a review of Henri Verneuil's Les Morfalous. A favourite of mine: Daney's review of Et Dieu créa la femme. 4,500 unique visitors throughout the year, but this is a meaningless figure as the majority must be robots browsing content. I prefer to count the fifth of these (900) which stayed more than a minute on the site. And nearly half of all visitors are returning ones. Only 65% of visits came from English-speaking countries - a pointer towards a global interest in Daney via the English translations. I know of several people who have translated Daney into their languages from the English translations they found. The posts on Preminger, Journey of a cine-son, Smorgasborg and Losey were clear favourites. (I'm hoping no publisher would dare interpret these numbers as an indication of a possible readership, they would be very sad people). So here's to more Daney in 2013. Happy new year to every one!